JUUL WAS DESIGNED WITH SMOKERS IN MIND. With its unique satisfaction profile, simple interface and flavour variety, JUUL was designed with smokers in mind. By accommodating cigarette-like nicotine levels, JUUL provides satisfaction to meet the standards of smokers looking to switch from smoking cigarettes. Unlike standard e-cigarettes, which use free-base nicotine, JUUL uses nicotine salts as found in the tobacco leaf. With its unique satisfaction profile, simple interface, flavour variety and lack of lingering smell, JUUL stands out as the vapour alternative. Everything a smoker needs to make the switch. 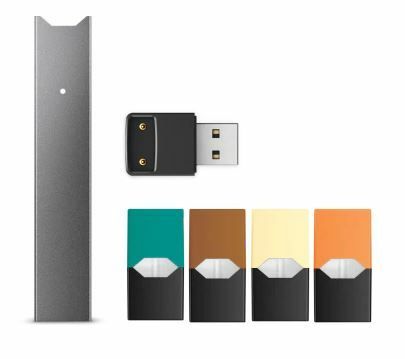 Includes JUUL device + USB charging dock + four JUULpods in 1.7% nicotine strength (Mango Nectar, Royal Creme, Golden Tobacco, Glacier Mint).